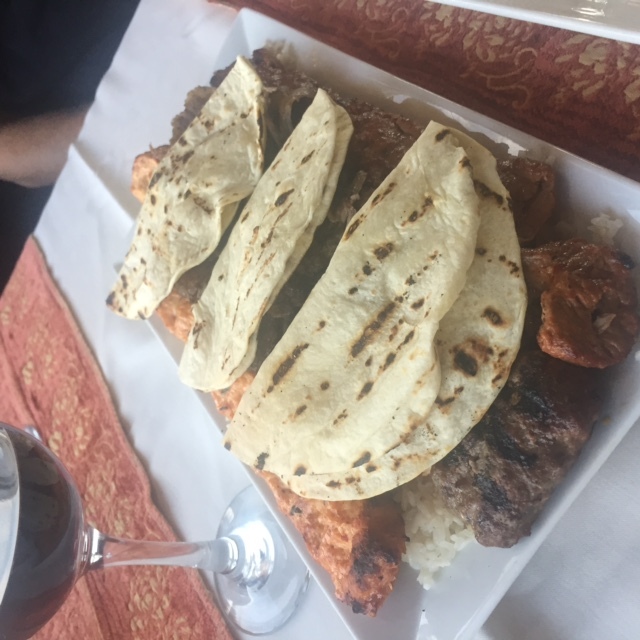 Alaturco Mediterranean Grill in Clifton Park was the perfect date night spot to celebrate my husband’s birthday last month. We made a reservation for two at 6pm on a Saturday night, and they sat us at cozy booth by the window. While the view only overlooked the sun setting over the Clifton Park plaza parking lot, something about the experience made both of us feel like we were on vacation. Maybe it was the early fall heat wave and the pleasant bread aroma? The server welcomed us and immediately gave us delicious pita bread, fresh out of the oven with hummus and a dipping sauce. For our appetizer we ordered the Hot Medley (finger rolls, falafel, zucchini pancake, and mozzarella sticks). Every item was delicious, though I was a bit disappointed that they had run out of cauliflower because I would have loved to try the Try Me Cauliflower. For our main entree, we shared the Mixed Grill for Two, a huge portion of adana, chicken adana, shish, doner, and kofte. (The minced grilled lamb and chicken was cooked and seasoned perfectly and tasted just as yummy the day after). We were full from the pita bread and the appetizers so we asked them to wrap up half of our entree so we could have room for dessert. The server was adamant that we order the kunefefor dessert. He explained that it was a unique Turkish dessert you can’t find anywhere else so I gave in. It was served in a small iron baking dish. This deliciousness was baked shredded wheat toasted, soaked in sweet syrup. Not diabetic friendly but no regrets! At least the rest of our dinner was healthy. Check out Alaturco if you are craving home cooked Mediterranean/Turkish cuisine. Turkish coffee and tea to end a very filling dinner.